Your at the right adress at Ganzeboom Transmissions if you want to rebuild your transmission. Experience and knowledge are important in this business, and since we have been rebuilding gearboxes since 1968 we have that for sure! This craft keeps developing and that is why we make sure our employees are equiped with the most recent technical knowledge and tools so they can do the best job possible. When we rebuild a transmissiono at Ganzeboom Transmissions we completelly check the transmissioin, every component is inspected for wear and tear. 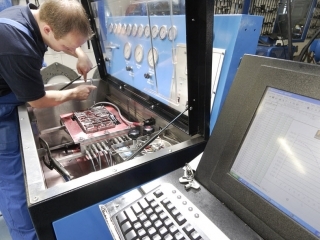 We combine knowledge, quality and top of the line service to ensure returning a properly functioning gearbox. After we have rebuild a transmissions we thoroughly test it to ensure we deliver a properly functioning product. Due to our special Axiline testbench we can completelly test the gearbox. We also have an Answermatic valvebody tester, through which we can test individual valves to see if they're in good working order. When we rebuild automatic gearboxes we regularly notice defects in the torque converter. This is why we also rebuild the torque converter when we rebuild an automatical gearbox. Due to our hightech machinery, such as computerguided welding and balancing equipment, our specialized employees can perfectly execute rebuilding torque converters. 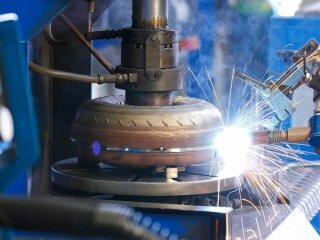 We use advanced equipment such as computerguided welding and balancing equipment during the rebuilding of a torque converter. We do more than only rebuilding transmissions. We also deliver parts for numerous transmissions out of our own stock, as well as complete transmissions and we can often diagnose your transmission through the telephone. So you'll know immediately whether your transmission needs to be rebuild. Would you like to learn more about the options for rebuilding transmissions? You can send us an inquiry through the form below, we are happy to advise you!